Cancer Focus Northern Ireland is providing an art therapy service, free of charge, for cancer patients in Downpatrick and the surrounding area. Running every Wednesday for six weeks from 18 September until 23 October, the art therapy group will meet from 2.30pm to 4.30pm at Downe Hospital, 2 Struell Wells Road, Downpatrick. Caryl Sibbett, Sessional Art Therapist with Cancer Focus, said: “You do not need to be artistic or have any experience in art to enjoy the benefits of art therapy. 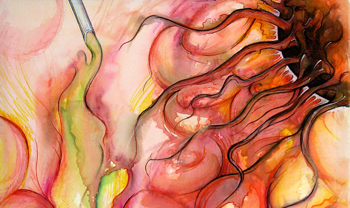 Art therapy can help people communicate anxiety or stress. In my experience many participants find the creative process relaxing and they can unwind while chatting to others who are in a similar situation. While he was in hospital he was visited by a Cancer Focus counsellor. “The counsellor was a real lifeline. I was able to share things with him that I couldn’t speak about to my family and friends,” added Matthew. “I was encouraged to start drawing again. I’d always enjoyed art but since I’d been ill, I’d lost interest in it. He told me about the Art Therapy service that Cancer Focus provides but to be honest, but initially I didn’t think it was my kind of thing. “I half-heartedly went along to one of the group sessions in Downpatrick and slowly began to ease myself into drawing again. The group was great – everyone had been affected by cancer so it felt like we were all in it together. If I wasn’t able to go for a couple of weeks people would ask me how I was – there was real concern for my welfare. Cancer Focus’ Art Therapy sessions are entirely confidential and take place in a safe and caring environment. All materials are provided free of charge and participants can use a variety of mediums such as paints, pastels, pencils or clay.